The Garrotxa Volcanic Zone is situated 100 kilometres to the north of Barcelona, an approximate road journey of two hours. It contains some of the most interesting volcanic landscape in Europe. There are thirty Strombolian volcanic cones, a few explosive phreatomagmatic craters, other alternating Strombolian/explosive volcanoes and over twenty very unusually constructed basaltic lava flows. In addition, the area’s moist Mediterranean mountain climate has contributed to lush vegetation and a spectacular landscape. Moves to give the volcanic zone legal status go back as far as 1917 but it was not until 1975 that a serious conservation campaign won widespread support, culminating in protective legislation in 1982. A sharp rise in urbanisation and industrial development in the area had begun to affect the traditional rustic landscape. Volcanic craters were being used as civic refuse disposal sites and a particularly grave threat to the survival of some of the most interesting volcanoes was posed by cinder quarries taking material for use in building block manufacture. Volcanism is of a basic type, involving basanitic and basaltic lava. The last dated eruption occurred 11,500 years ago, thus though volcanic activity has ceased, it cannot be considered to be finally extinct. The volcanic eruptions varied greatly in intensity owing to the characteristics of the substratum crossed by the vent and especially because the magma encountered layers of water-saturated materials. The thirty or so volcanic cones are in a very good state of natural conservation, considering their age. Most of the craters are visible and consist of cinder material: scoriae and lapilli with intervening layers of volcanic bombs. 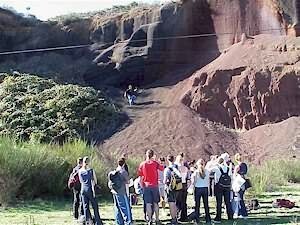 Pyroclastic hecciae are also visible, as well as cineritics and base surge deposits. At the Fontfreda cliffs, river erosion has revealed magnificent prism-shaped columns while at Castellfollit, spectacular layers of lava from different lava flows are superimposed creating a spectacular cliff with the village sited at the top. At the 17,000 year-old El Croscat volcano, the lava mass has a rough surface covered with lava blocks and numerous blisters (projecting gas bubbles). 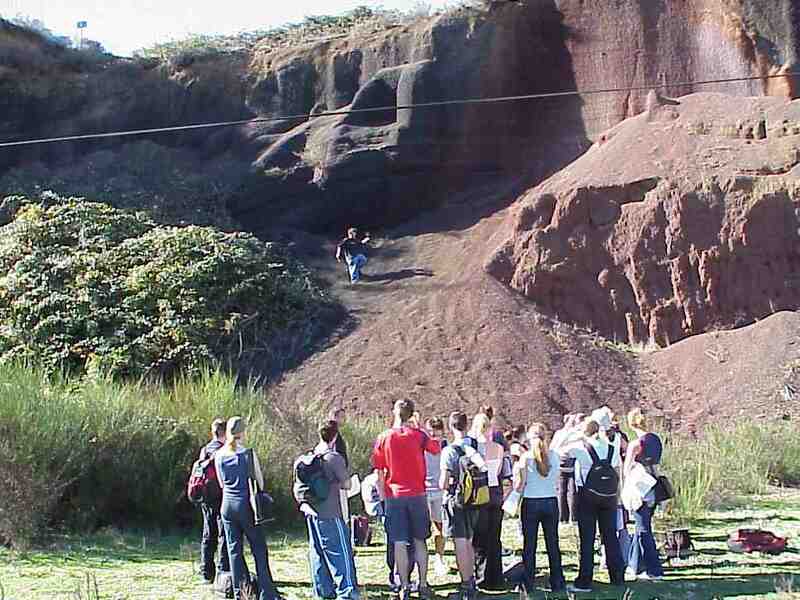 The objective is to apply a scientific method similar to that utilised by vulcanologists to study the causes of the volcanic eruptions, the anatomy of the volcano and the nature of the volcanic rocks. Form hypotheses about the stages in the formation of a volcano. Form hypotheses about the type of volcanic eruption that occurred. Relate the eruption and seismic activity in the area to geological map data. The objective is to analyse the environmental impact of some of the human activities, the actions taken to restore the damaged environments, and produce a management plan for the Park. 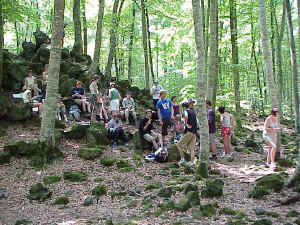 Introduction to the geological characteristics of the Park and the aims and values of the Natural Park. Assess the value of the Park’s natural resources, and the environmental impact of both cinder extraction and refuse disposal sites. Study the restoration techniques used in the degraded sites. Draw up a management plan which resolves the environmental issues and problems of the Park. The social, economic and environmental effects of rural depopulation. The causes and effects of land use changes in hill farming. A case study of two contrasting villages, one declining, one growing and the implications for sustainable rural development. 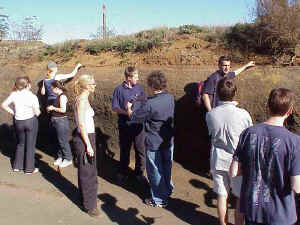 Soil Zonation: Brown Earths, Gleys and Podsols. Volcanic soils: rankers and volcanic sub-types.